The Lululemon Yoga Mat is one of the most popular mats on the market with its non-slip, stickiness and easy to grip texture. The best eco-friendly mat you can find that is durable, non-slip and will hold up during any type of yoga. The Jade Harmony Yoga Mat is versatile but especially great for hot yoga lovers. Comfort, portability, and durability are what you’ll get with the popular Manduka Pro Yoga Mat. The perfect yoga mat is one of the most important parts of your experience as a yogi. Whether you’re a beginner or looking to replace an old mat, choosing the perfect mat can be an arduous task. You want to be 100% sure that your mat will last long, feel great and not slip during downward dog. To help you and us out, we teamed up with some of the biggest yogis out there to help you figure out the best yoga mat for you. The Hugger Mugger Yoga Mat is one of our favorites because of it’s nonslip grip, earth-friendly material, and cushiony texture. This mat offers optimum comfortability with its ¼ inch thickness. Your knees will thank you during practice because of the mat’s ¼ inch thickness. The earth and your consciousness will also thank you because this mat is made of recyclable materials. One of the issues that you may run into when choosing an eco-friendly mat is that the materials aren’t as durable. 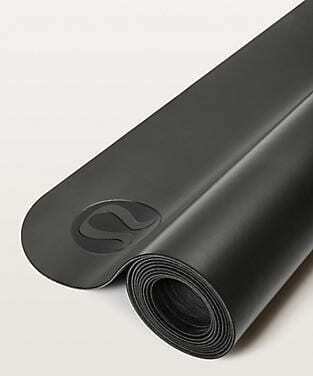 With the Hugger Mugger Rubber Yoga Mat, you get an earth-friendly rubber that will also last longer than other brands. If you’re looking for a versatile yoga mat that will last you years, the Jade Harmony Yoga Mat is a good one to put on your list. Jade Yoga Mats are extremely popular among yoga teachers and yogis alike for many reasons. The mats are known for being thick, which gives great and support and makes for a comfortable practice. The mat is also made of rubber material which is great for gripping, nonslip and extremely eco-friendly. The comfort and versatility of Jade Yoga Mats are some of the reasons why this brand is one of yoga teacher and author Jessamyn’s favorite. She especially recommends the Jade Fusion Mat, which comes in multiple sizes and is even a great option for hot yoga. The mat’s durability and comfortability come from its earth-friendly material as well. Yoga beginners may be tempted to go with the first mat that catches their eye but we recommend going for a quality mat that will last. Diane Malaspina at Yoga Medicine says the Manduka Yoga Mat is one of the best yoga mats on the market because of its durability and versatility. It’s no surprise that yoga powerhouse brand Lululemon also makes one of the best yoga mats on the market. 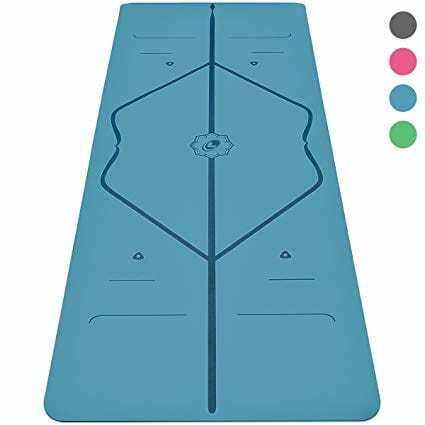 On top of being a great choice for any type of yoga, this mat is especially great for anyone who sweats a bit more than usual, especially in the hands. A mat that won’t slip even during the sweatiest practices is crucial. As a professional trainer and yoga instructor, Dempsey Marks highly recommends this mat for the best grip. For yogis who are always on the go, a mat that is lightweight, portable but also durable is a top priority. Liforme is one of the top brands in the yoga mat industry and their travel mat packs in all the same great qualities in a much lighter mat. 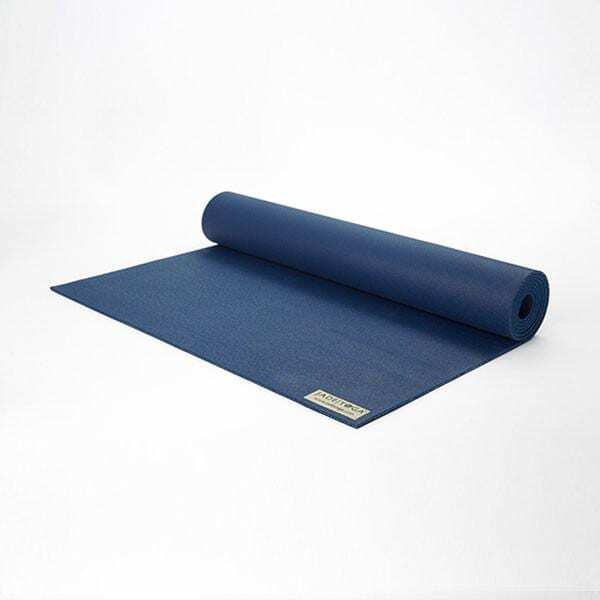 The Liforme mat has one of the grippiest and smoothest surfaces for all yoga mats there. You’ll also love the unique alignment marker system that is etched into the mat to make sure you’re doing the poses right. Jenay Zahler of NamasteJenay says Liforme is her brand of choice. The type of yoga mat you should get entirely depends on your personal preferences, your lifestyle and the type of yoga you usually do. Thanks to the proliferation of the yoga industry, there are hundreds of yoga mats to choose from. The most important part is knowing exactly what to look for. Choosing the thickness of your yoga can make a huge difference during your practice. The size and thickness of the mat you choose are all up to your personal preference. Your standard yoga mat will be around ⅛ inch thick, but they can range all the way up to ¼ inch. Why choose a thicker mat? A thicker mat will protect your knees in certain poses like the camel pose or crescent lunge. When doing poses that put a lot of pressure on the knees, you’ll want a mat that will support your knees and not cause too much pain. On the other hand, a mat that is too thick can make it difficult to feel grounded during stability poses. Poses like the tree pose requires the foot to feel anchored to the ground. If your yoga mat is too thick, it makes it more difficult to align yourself and hold the pose. What your yoga mat is made of is very important for a few reasons. First, the quality of the material determines how it fair over time. Secondly, the texture, sponginess, and stickiness will affect your practice. Yoga mats are usually made up of PVC or a blend of several types of material. The right material for you depends on your personal preference. 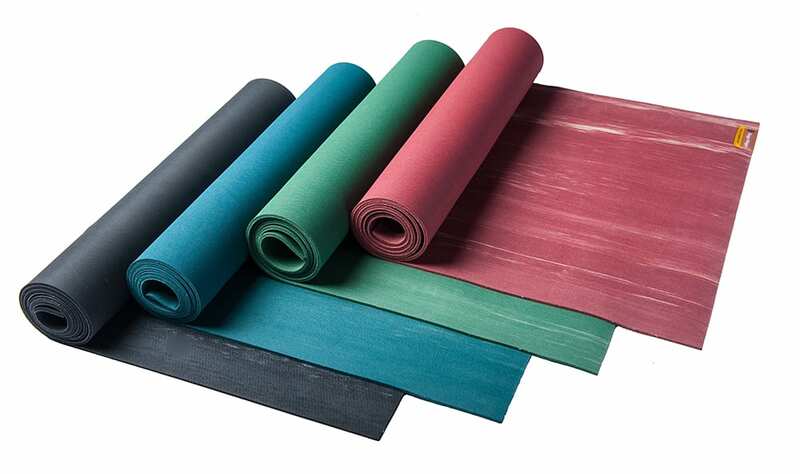 Other types of materials you may find in yoga mats are recycled rubber, cork, jute, and cotton. How do you know which material is right for you? It all depends on the texture of the mat and the style of yoga you usually do. For example, hot yoga lovers will need material that absorbs sweat easily, like natural cotton or jute. Many brands are turning to more eco-friendly and non-toxic materials for their yoga mats. Materials like recyclable rubber, cork, and jute (a plant-based fiber) are great options for eco-friendly options. While all of these materials are great, a mat made out of PVC usually holds up the best and will last you years. Just like material, a yoga mat’s texture is all about preference. Even if you get the best yoga mat on the market, if you don’t like the texture of the mat, you’ll find yourself struggling to concentrate during practice. The texture is also essential for grip as it determines how much you slip and stick during a pose. Traditional yoga mats are usually sticky, like PVC, and provides a perfect amount of grip. If you’re wanting the same type of grippy texture but want to try a green mat, check out the reviews of different mats and see which one you think would fit for you. Beginners will probably not be sure on whether to choose a smooth texture vs a ribbed texture. Over time you will be able to identify your personal preference and choose the mat that works best for you. Luckily, most mats are available in a wide range of textures. Some diehard yogis are self-motivated enough to do at home practices consistently but most people attend classes at a yoga studio. This requires your yoga mat to be easy to carry onto the train, bus or in your car. A yoga mat’s portability depends on the material, the size and the lightness, so check out the reviews to know which one would fit you the best. When purchasing any product we should all keep the product’s materials in mind. Researching the materials is a quick way to know which one you should look out for. As mentioned earlier, there are more and more yoga mats made out of natural, nontoxic materials. PVC, which is the traditional yoga mat material, is unfortunately not biodegradable or recyclable, so avoid these mats if you are earth conscious. If you are concerned about using products that are earth-friendly, go with a mat made of recycled rubber, jute, organic cotton or cork. Keep in mind that these materials may be great for the earth, but may not be as durable as the more traditional mat materials. Out of all of the eco-friendly mats, cork is known to last pretty long and stand up to wear and tear. Once you finally know the exact type of yoga mat you want, you can focus on the most exciting part, the style! There are tons of great styles and patterns out there to choose from. All of the picks on our list of best yoga mats come in various colors so you can customize it to your liking. The idea is that you will spend a lot of time on your mat, so choose one that you’ll love to stare at. Ok, we lied. The last part that you have to consider when choosing your yoga mat is how much money you’re willing to spend. The truth is, a lot of the best yoga mats have a hefty price tag. This is due to a mix of hype, company reputation and the quality of the materials. A yoga mat can cost you anywhere from $30-$150 but the most important thing is choosing one that will give you the best value. The higher the price doesn’t always equal the highest quality. If style and special features aren’t important to you, then you can find a good mat on the lower end of the price range. However, if you need a mat made with eco-friendly material and a sick design, be ready to spend a bit more. One of the most important things to remember is to maintain your yoga mat, you will need to clean it consistently. A yoga mat is a breeding ground for build-up and trapped bacteria from sweat and dirt. You especially want to clean your mat if you’re using it multiple times a week. So what is the best way to clean your mat? Cleaning a mat is pretty easy. Once a week use warm water and a gentle cleanser and wipe the mat down. Let it air dry away from direct sunlight and try to avoid scrubbing it with rough textures. There are also tons of DIY yoga mat cleaner recipes available online. Most recipes are a concoction of water and an essential oil like tea tree oil or lavender. Cleaning your yoga mat will keep the gross bacteria away and will help your mat last you a long time. Do you really need a mat for yoga? Yes. While yoga is an extremely relaxing and centering practice, it requires the body to be in positions that would be difficult without any support. You need a yoga mat for many reasons. Yoga mats are designed to not slip and hold up during strenuous poses. Believe us, you don’t want to accidentally slip during a pose. It can be frustrating, breaks concentration and even dangerous. Your comfort and safety are extremely important during yoga practice and we promise that you will instantly notice the difference when you use one of the best yoga mats. Are exercise mats and yoga mats the same? An exercise mat isn’t quite the same as a yoga mat. You could use a yoga mat to do exercises other than yoga, but you won’t always be able to practice yoga on a run of the mill exercise mat. 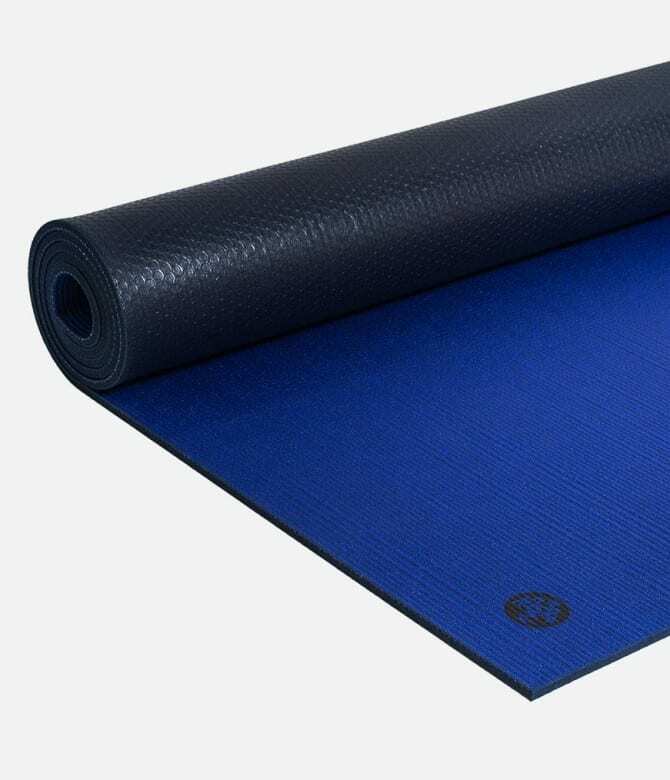 Like we previously mentioned, a yoga mat is specifically designed with materials that will prevent slip and grip well. Most gym mats are made with different materials that are designed to be comfortable, but not necessarily nonslip. If you are beginning a yoga journey its best to invest in a good mat specifically made for yoga. How long will a yoga mat last for? The durability of your yoga mat depends on the quality of the material and how much you use it. It is completely normal for a yoga mat to show normal signs of wear and tear after consistent use. A mix of the sweat, tension, and stretching of the mat material will cause it to wear down over time. The type of material it uses also affects the yoga mat’s life span. Eco-friendly made mats tend to wear down much faster than the synthetic PVC yoga mats. However, many of the best yoga mats on our list are known to hold up for years. Diane of Yoga Medicine claims her Manduka Yoga Mat has lasted her years. “These mats last! Each are the original mat I’ve purchased – I’ve never had to replace. I’ve been practicing on the Black Mat Pro since 2001 and the ProLite since 2009.” With proper care and maintenance, a good yoga mat can last you many years.